Down in the sewer lair, Leo is subjecting his brothers and April to an all-day “Space Heroes” marathon. The others are spared when a storm blows through, disabling the satellite dish. Leo curses nature, but Splinter reminds him that nature is something they are all a part of and that its forces should never be trifled with. He says that this fact is best exemplified by the tree in their dojo, which survives on minimal sunlight and water through the tiniest drainage gate in the street. Suddenly, the TV turns back on long enough for a news report from Carlos Chiang O’Brien *click* Gambe. Apparently, an entire block on East 85th Street has been overtaken by vines. The Turtles and April pile into the Shellraiser and head out to investigate. Arriving on the scene, April is immediately attacked by killer vines, but cuts herself free with her bladed fans. Donnie finds people trapped in strange pods and comes to the conclusion that Snakeweed is back in town. 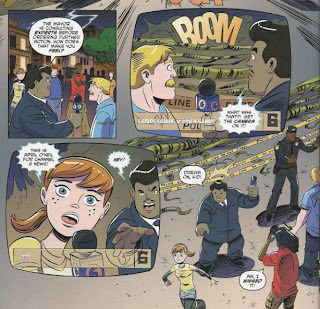 The Turtles and April start freeing the people before they can be turned into fertilizer, but Donnie calculates that they could never reach all the people on the block in time. If they hope to save everyone, they’ll have to stop Snakeweed (as he’s the “root” of the infestation). Snakeweed obliges by bursting through a wall Kool-Aid style and attacking. As the Turtles take on the mutant plant-man, April keeps Gambe from filming them by stealing his mic. Snakeweed escapes, swearing that once his “bud” blooms, humanity will be overrun with more plant mutants like himself. Donnie spots the bud in question on a rooftop and figures it must be packed with Snakeweed spores. 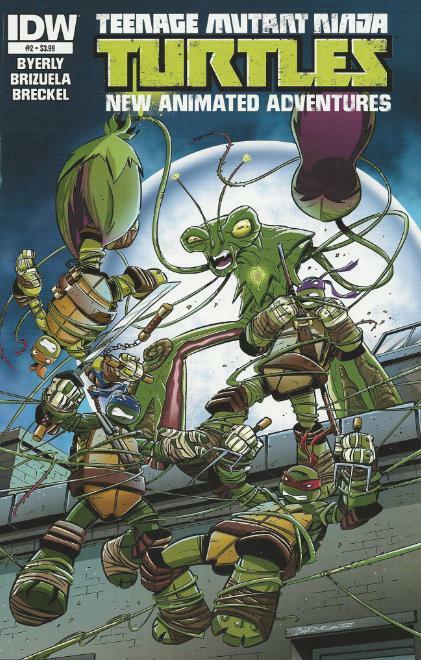 Leo tells Raph and Donnie to go after the bud and keep it from opening while he and Mike try to take Snakeweed out. April, meanwhile, is left behind to tend to the crowd. Donnie and Raph proceed to fight their way up to the roof where the bud is stationed. 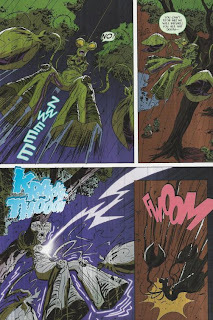 They have some trouble with killer vines, but Raph’s brute force is enough to get them past any obstacles. Upon reaching the roof, Raph attempts to turn that brute force onto the bud, but Donnie stops him. He warns Raph that if they burst the bud, the spores will spread. Before Donnie can calculate a way to keep the bud from blossoming, more killer vines attack them. Elsewhere, Leo and Mike track Snakeweed to Central Park. They challenge the plant-man, but he easily takes them down. Crashing into a sign advertising the turtle habitat at Central Park Zoo, Leo comes up with a plan. He and Mikey proceed to lure Snakeweed to the turtle pond and keep him submerged in the water. Consequently, this “overwaters” Snakeweed and all his killer vines and pods spread throughout the city wither and die. With the vines dead, Donnie and Raph free themselves. They’re met with an unpleasant sight, as the bud is about to bloom. Thinking fast, Donnie and Raph grab a tarp and throw it over the bud so the spores cannot be released. Back in Central Park, Mikey ensnares Snakeweed in his kussari-gama chain. Leo then launches a grappling hook onto the tallest tree in the area and attaches the recoil mechanism to the chain. Snakeweed is hoisted up to the top of the tree and immediately struck by a blast of lightning from the storm. Snakeweed falls to the ground, turning to ash. Later, with the storm passed, the Turtles and April resign themselves to the “Space Heroes” marathon. Leo decides to pass on the marathon and goes to see Splinter (the Turtles immediately fight over the remote). Sitting beneath the tree in the dojo, he tells Splinter that he was right about the forces of nature, which saved them all in the end. *This story is continued from TMNT New Animated Adventures #1. 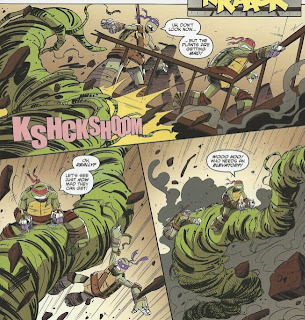 The story continues in TMNT New Animated Adventures #3. *Snakeweed was shown transforming people into fertilizer in the episode “New Girl in Town”. April received her bladed fan weapons from Splinter in “Baxter's Gambit”. 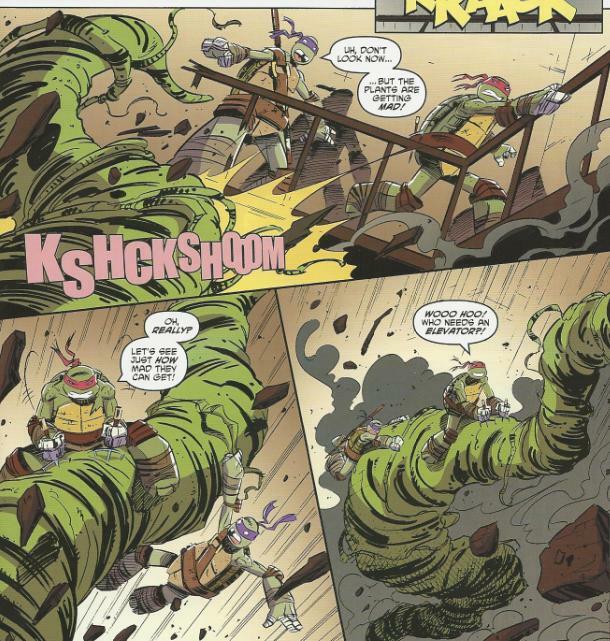 *Coincidentally, just two months before this issue, Panini Magazines over in Europe released a very similar TMNT vs. Snakeweed story in TMNT Magazine (Panini) #2. It even ends with Snakeweed getting defeated by a bolt of lightning. *This issue was originally published with 2 variant covers: Regular Cover by Brizuela, Subscription Variant by Ben Bates. The Nickelodeon TMNT cartoon is by a wide margin the most “mutant of the week” animated series the TMNT have ever received. People like to look back at the Fred Wolf cartoon as being a nonstop action figure-shilling machine for Playmates, but truth be told, that show was surprisingly reserved in its use of mutant villains. They really didn’t show up all that often. The Nick cartoon, on the other hand? It got to the point where that show was creating a new mutant every week. Don’t get me wrong, I LIKE most of the mutant villains the show has introduced, but c’mon guys. Pace yourselves. With that in mind, I do wonder how frequently New Animated Adventures will be utilizing these established villains? Will it employ new villains? Will it reintroduce classic villains the cartoon has no plans on using? Only time will tell, I suppose. In terms of the mutant baddies introduced in the cartoon, Snakeweed was the first and, to be honest, has probably been my least favorite of the bunch (next to maybe Spider Bytez; not even a voice over from Lewis Black can save that character from his terrible name and ridiculous design). Snakeweed lacks the humorous quirks that have made the other mutants fun to watch. He’s just so generic. So needless to say, he doesn’t make for a very compelling enemy even in comic book form. To Byerly’s credit, he pulls something of a fakeout, with the issue starting out like a retread of “New Girl in Town” before transitioning into a fresh scheme from Snakeweed. But even if Snakeweed’s plan is grander this time around, the bad guy is still boring as all get out. I dunno, I guess not all the villains can be “funny”, but when it comes to making them stand out… funny does certainly help. Snakeweed’s not exactly an A-class foe of the TMNT as it is, so he could probably use an injection of personality. Hell, even Spider Bytez has that “obnoxious jerk” thing going for him. What I dug more with this issue was how every character got their own little moment to shine. Raph’s brute force got him and Donnie through the building. Don’s ingenuity kept the bud from spreading its spores even after it bloomed. Leo’s resourcefulness took Snakeweed down using only the elements at hand. And Mikey… Eh. He helped. April also seems to have learned a lesson from the previous issue. The Turtles repeatedly tell her to be careful and stay where it’s safe and she never argues the point with them. She received a bit of a humbling last issue, learning that she still isn’t quite ready for the same level of action as the Turtles. Rather than have her conveniently forget everything she just learned a story ago, Byerly has the effect last into this installment. It’s a subtle thing, but greatly appreciated. Grievances with Snakeweed’s quality as a villain aside, New Animated Adventures is still good all-ages reading. The self-contained issues feel like condensed episodes of the cartoon and just about everyone has a strong voice and personality. Brizuela’s art is as fluid as ever and Breckel continues to be a great match (though she colors Raph’s bandana orange a couple times in this one). And hey, “Space Heroes”. That is the best running gag in the whole show. April actually got her tessen from Splinter in "Baxter's Gambit", and used it for the first time in "Karai's Vendetta". So I'd put this somewhere between those two. Good call! Made the change to the Turtle Tips. Thanks! Yeah, Snakeweed could have never shown up again and I probably wouldn't have noticed. If anything, he should have remained a lackey of the Kraang, to at least give him some sort of function. Spider Bytz...I dunno'. I simultaneously like the aesthetic of the design, while also thinking it doesn't work at all as a representation of an actual creature, if that makes sense. He's like a corporate logo given three dimensional form. Incidentally, can we safely assume that Dimension X is inhabited by nothing but biological nightmares like the mutants we've seen so far? Because you know the Turtles will eventually go there, and I'd like it to be a little bit horrifying when they do. I totally agree about the badly designed "original" baddies. It's one of the reasons I couldn't get attached to this TMNT incarnation. I can't even really accept Shredder's two main henchmen. There's Dogpound who kinda' looks like Sulley from Monsters, Inc., he's just a bit too awkward. But Fishface? Every time I see him, I can't help but smile. He just reminds me of Fish Guy from The Mask cartoon (where Rob Paulsen voiced The Mask). That character was a teenager who wanted to gain special powers. Then he became a fish out of water, losing his ability to be self-sufficient - which was of course exactly what the show was making fun of.